Tenants and their supporters rallied in front of 1049 Market Street on November 12, demanding that landlord John Gall withdraw eviction notices for the building. Gall wants to convert residentially occupied units at 1049 Market to offices, a move that would displace tenants and reverse progress toward revitalizing Mid-Market. It’s the residents who keep the street alive after office workers leave, which is why the city is trying to increase housing in the area. In a September 13, 2013 memo to tenants, the owners of 1049 Market claimed that “overly restrictive” building codes “forced” them to evict the tenants. But their eviction efforts have continued even after DBI suspended the notice of violation that allegedly triggered the termination notices. The Planning Department has since ruled that 1049 Market has abandoned its historic office use, requiring Gall to apply to be a new office building under the limits of Prop M. This is an office project going nowhere. Yet despite Mayor Lee, Supervisor Kim, DBI and Planning all telling Gall to stop these evictions, he continues to proceed—which is why tenants and activists were at 1049 Market demanding answers. Tenants and their supporters rallied in front of 1049 Market Street on November 12, demanding that landlord John Gall withdraw eviction notices for the building. Gall wants to convert residentially occupied units at 1049 Market to offices, a move that would displace tenants and reverse progress toward revitalizing Mid-Market. It’s the residents who keep the street alive after office workers leave, which is why the city is trying to increase housing in the area. In a September 13, 2013 memo to tenants, the owners of 1049 Market claimed that “overly restrictive” building codes “forced” them to evict the tenants. But their eviction efforts have continued even after DBI suspended the notice of violation that allegedly triggered the termination notices. The Planning Department has since ruled that 1049 Market has abandoned its historic office use, requiring Gall to apply to be a new office building under the limits of Prop M. This is an office project going nowhere. Yet despite Mayor Lee, Supervisor Kim, DBI and Planning all telling Gall to stop these evictions, he continues to proceed—which is why tenants and activists were at 1049 Market demanding answers. 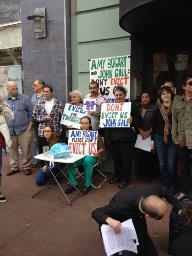 Tenants and their supporters rallied in front of 1049 Market Street on November 12, demanding that landlord John Gall withdraw eviction notices for the building. Gall wants to convert residentially occupied units at 1049 Market to offices, a move that would displace tenants and reverse progress toward revitalizing Mid-Market. It’s the residents who keep the street alive after office workers leave, which is why the city is trying to increase housing in the area. In a September 13, 2013 memo to tenants, the owners of 1049 Market claimed that “overly restrictive” building codes “forced” them to evict the tenants. But their eviction efforts have continued even after DBI suspended the notice of violation that allegedly triggered the termination notices. The Planning Department has since ruled that 1049 Market has abandoned its historic office use, requiring Gall to apply to be a new office building under the limits of Prop M. This is an office project going nowhere. Yet despite Mayor Lee, Supervisor Kim, DBI and Planning all telling Gall to stop these evictions, he continues to proceed—which is why tenants and activists were at 1049 Market demanding answers. Tenants and their supporters rallied in front of 1049 Market Street on November 12, demanding that landlord John Gall withdraw eviction notices for the building. Gall wants to convert residentially occupied units at 1049 Market to offices, a move that would displace tenants and reverse progress toward revitalizing Mid-Market. It’s the residents who keep the street alive after office workers leave, which is why the city is trying to increase housing in the area. In a September 13, 2013 memo to tenants, the owners of 1049 Market claimed that “overly restrictive” building codes “forced” them to evict the tenants. But their eviction efforts have continued even after DBI suspended the notice of violation that allegedly triggered the termination notices. The Planning Department has since ruled that 1049 Market has abandoned its historic office use, requiring Gall to apply to be a new office building under the limits of Prop M. This is an office project going nowhere. Yet despite Mayor Lee, Supervisor Kim, DBI and Planning all telling Gall to stop these evictions, he continues to proceed—which is why tenants and activists were at 1049 Market demanding answers.